The lungs are a pair of cone-shaped breathing organs in the chest. The lungs bring oxygen into the body as you breathe in. They release carbon dioxide, a waste product of the body's cells, as you breathe out. Each lung has sections called lobes. The left lung have two lobes. The right lung is slightly larger and has three lobes. Two tubes called bronchi lead from the trachea (windpipe) to the right and left lungs. Tiny air sacs called alveoli and small tubes called bronchioles make up the inside of the lungs. The lining of the lungs is called the pleura. Lung cancer is a term used to describe a growth of abnormal cells inside the lung - these cells continue to grow in an unlimited fashion until removed or treated. The abnormal cells stick together and produce a growth or fluid. Doctors call this abnormal cluster of cells a 'tumour'. Cancer that starts and grows in the lung is known as primary 'lung cancer'. Cancer that has spread to the lungs having started as a 'primary' in another part of the body such as the bowel are called lung 'secondaries' or 'metastases'. Bowel cancer can spread to the lungs, pleura, and lymph nodes surrounding the lungs. When a diagnosis of bowel cancer in made, patients undergo a series of tests to see if the cancer has spread. A diagnosis of secondary bowel cancer in the lungs can happen when you are initially told you have bowel cancer or some time after the initial diagnosis, during routine follow up. Chest X-ray A chest x-ray may be taken to determine if the cancer has spread to your lungs and to provide information about the general health of your lungs, which is important when making treatment plans. CT scans A CT scan creates a cross sectional, 3D image of the body. The scan gives detailed pictures of the tumour(s) and surrounding tissues and organs, enabling the doctors treating you to gain an accurate picture of the tumour, and its location. PET-CT scan A CT scan can be combined with a PET scan which is a medical imaging technique which produces a three-dimensional, colour image of your body. When taken together, the results can be combined to show where there are any cell changes in the body, and whether the cancer has spread. MRI scan Magnetic resonance imaging (MRI) uses magnetic and radio waves (not X-rays) to show the tumour(s) in great detail. During the scan you will have to lie in the scanner for up to an hour, and, whilst it is very noisy, it is painless. Let the doctors know in advance if you are claustrophobic. Your doctor will work with you to choose the most useful tests to identify if your bowel cancer has spread to the lungs. Treatment for lung metastases depends on the size, location in the lungs, extent, individual age, general health and feelings about the treatment. Surgery can treat lung metastases consisting of a procedure that may cure lung metastases if it is well confined and if it has not spread to other parts of the body. The treatment includes surgical removal of part or the entire lung called pulmonary resection. 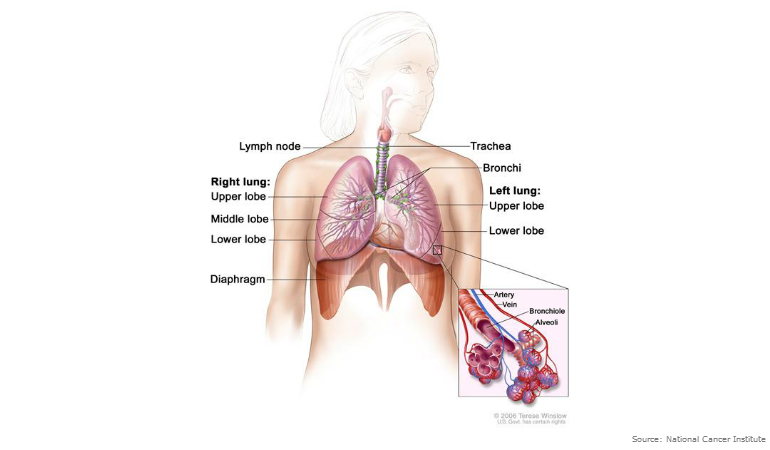 Three main types of surgery are used in metastatic lung cancer treatment. The choice depends on the size and location of the tumor, the extent of the cancer, and the general health of the patient. The surgeon will remove only the diseased portion of the lung. All types of lung operations require a thoracotomy which is an incision (cut) into the chest wall. An operation to remove a small part of the lung is called a segmental or wedge resection. 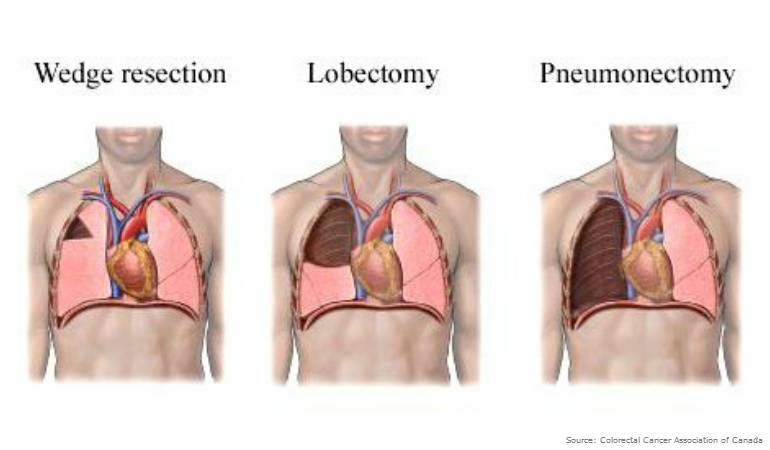 An operation to remove a lobe of the lung is called a lobectomy. 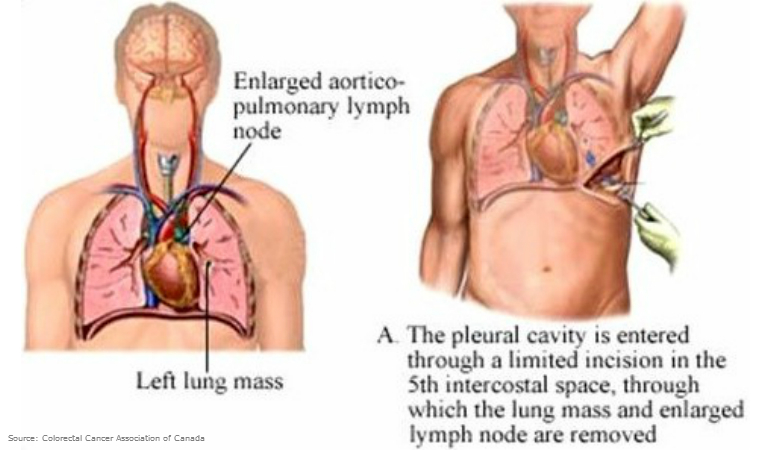 A pneumonectomy is the removal of an entire lung. During the procedure the chest wall is opened, ribs are spread and the lung is entered to remove the diseased portion, thereby causing the lung to collapse. After lung surgery, air and fluid tend to collect in the chest. The air and fluid are drained out through a tube (chest tube) which is connected to a drainage system. An incision (cut) will usually extend from just below your underarm to around the back. The incision is closed with dissolvable sutures (thread). Minimally invasive thoracic surgery, also called thoracoscopy or thoracoscopic surgery is surgery of the chest that is performed with a thoracoscope (small video-scope) using small incisions and special instruments to minimise trauma. During thoracoscopic surgery, three small (approximately 2.5cm) incisions are used as compared with one long 15cm to 20cm incision that is used during traditional, open thoracic surgery. Other names for this procedure include pleuroscopy or VATS (video-assisted thoracic surgery). It is performed in bowel cancer patients who have limited disease in their lungs. Thoracic surgery procedures routinely performed using a minimally invasive technique include VATS lobectomy and wedge resection. VATS lobectomy - Lobectomy (removal of a large section of the lung) can be performed using a minimally invasive approach. During video-assisted lobectomy, three 2.5cam incisions and one 7.5cm to 10cm incision are made to provide access to the chest cavity without spreading of the ribs. The patient experiences a more rapid recovery with less pain and a shorter hospital stay (usually 3 days) than traditional thoracotomy surgery. The surgical outcomes of video-assisted lobectomy are comparable to traditional lobectomy outcomes. Although minimally invasive approaches are considered for every patient, in some cases, patients who have a large or more central tumor may not be candidates for video-assisted lobectomy. VATS wedge resection - as previously stated, a wedge resection is the surgical removal of a wedge-shaped portion of tissue from one, or both, lungs which can also be accomplished using this minimally invasive technique. A wedge resection is typically performed for the diagnosis or treatment of small lung nodules. Sometimes a patient is not fit for surgery, so treatment with chemotherapy, radiotherapy and/or targeted therapies are often considered as options. In addition to treating the cancer itself, your healthcare team is there to help ease any physical symptoms you may be experiencing as well as support you and your family emotionally and with the practical issues that may result from your cancer. For all stages of bowel cancer it is important to optimise your quality of life as much as possible. The outcome from bowel cancer will largely depend on the type and stage and the general health of the person with bowel cancer. It is important to remember that each person is different and results from statistics may not always be relevant to the person concerned. Different ways to treat bowel cancer are emerging all the time and many may be available in clinical trials. You can discuss this with your doctor. Family, carers and friends are an important source of help and support. Doctors fully understand that you may wish to have a second opinion. This may be to have their proposed course of action confirmed by another specialist or to explore the possibility of alternative treatments. Most doctors are willing to refer you for a second opinion if you feel it would be helpful, however they will be honest if they do not feel you will gain anything from seeing another specialist for their opinion. It is important that you recognise that getting a second opinion can take time and this could delay starting your treatment. If you feel that you want a second opinion, talk to your specialist or your GP about it and explain why you would like to seek another opinion; this can then be arranged if required. If you are considering entering a trial, you should discuss it not only with your doctors and nurses, but with your family and friends. They may also have worries and concerns and it is helpful to have a different point of view when you are making such a big decision. You can leave the trial at any time, without giving a reason, if you change your mind.  Please visit Bowel Cancer Australia's Clinical Trials webpage for further information.